In Manhattan, where real estate is at a premium, hotel pools are not so easy to come by. But dive in deep enough—into research... and your pockets, that is—and you'll uncover several swanky hotel pools that look downright ready for a toe-dipping, cocktail-sipping good time. Keep in mind that in order to find a decent-sized pool in NYC that's more than just an oversized bathtub, you'll need to spring for a room at a higher-end hotel (though a couple of hotels offer pool passes for day guests if you're looking to curtail a hefty lodging bill). So grab your towel, and get ready to lounge and cool down at one of Manhattan's best hotel swimming pools, each proposing an R & R-ready atmosphere, skyline views, and happening poolside bars. Looking to take the plunge on other Manhattan swimming pools that are open to more than just hotel guests? Check out NYC's best outdoor swimming pools, as well as entirely free outdoor public pools in NYC. 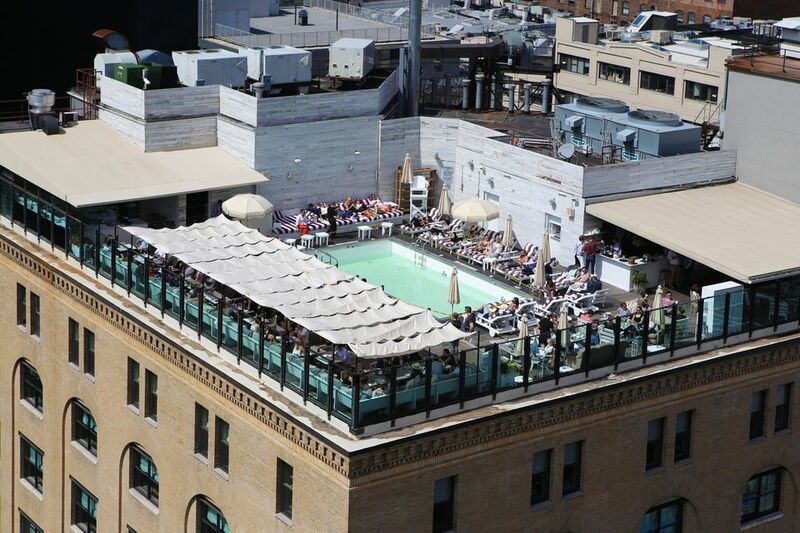 Dubbed "The Beach" at Dream Downtown, this Meatpacking District rooftop pool pulls out all the stops, complete with Montauk-imported sand to create a transporting faux beach effect. Measuring 50-feet long, dive deep and you'll uncover that the pool has a surprise glass bottom that overlooks the hotel lobby below. There's plenty of room to lounge on the 4,800-square-foot, French Riviera-inspired pool deck, lined with more than 50 chaise lounges, a couple of private cabanas for rent (in which guests can book spa treatments), a full-service bar, and an adjacent café (with a Mexican-influenced menu). Bonus: Non-hotel guests can purchase daytime weekday passes. 355 W. 16th St., ​btwn 8th & 9th Aves. The luxe Le Parker Meridien hotel, in Midtown, invites guests to "swim on top of the world," with a penthouse pool hugged by floor-to-ceiling windows looking out over Central Park. When not taking a dip in the 40-foot-long all-seasons indoor lap pool, guests can dry off and soak up some rays on the multi-level outdoor sundeck, or indulge in the small plates and cocktail menu. Non-hotel guests who live locally can sign up for a pool-and-gym membership here. (rates fluctuate by season) to enjoy the facilities, as well as the hotel fitness center. 119 W. 56th St., ​btwn 6th & 7ths Aves. This chic Chelsea pool hideaway—dubbed "La Piscine" (meaning "pool" in French)—comes perched atop the Hôtel Americano, complete with plush lounge chairs, swoon-worthy 10th-floor Manhattan views (that extends over the nearby High Line park), a generous bar menu (pitcher of margarita, anyone? ), and a Mediterranean grill menu. Good news for non-hotel guests: The pool's open at a day rate, too (weekdays only). 518 W. 27th St., btwn 10th & 11th Aves. Set atop the Time Warner Center towers at Midtown-meets-Upper West Side's Columbus Circle, is the posh Mandarin Oriental New York hotel. Pampered guests can dip into the 75-foot indoor lap pool on the 35th floor, with oversized windows that let the daylight—and skyline and Hudson River views—pour in. The pool is part of the property's first-rate 14,500-square-foot spa if you're keen on pairing your swim with a spa treatment or two. 80 Columbus Circle at W. 60th St. This stylish member's club, set in the trendy Meatpacking District, boasts 30 hotel rooms and comes with a heated rooftop pool (opened year-round) that touts views over the Hudson River and downtown Manhattan. Only hotel guests or friends of members get a ticket in—if you're among the lucky few, order up food and drink while you kick back and relax on one of the plush chaise lounges, and enjoy one of the most exclusive spots in the city. 29-35 9th Ave., btwn W. 13th & W. 14th Sts. A haven in the posh The Peninsula New York, this glass-enclosed swimming pool is tucked away on the top floor of the 23-story property, with excellent views out over Midtown. Part of the hotel's tri-level spa complex, the 45-foot lap pool is complemented by a seasonal sundeck with loungers and a menu featuring healthy cuisine. Expect refined decor, complete with teak columns and a black-tile floor. Guests get access to daily aqua aerobics classes here, too. 700 5th Ave. at W. 55th St.
A tucked-away 17th-floor rooftop retreat in SoHo, The James New York's crowning (if small) seasonal pool beckons stylish sun-worshipers in season. Pool guests can lounge on the teak deck atop cushy chaise lounges while tucking into a light bites menu and sopping up the surrounding NYC skyline views. The rooftop bar here gives way to popular, free-entry, late-afternoon/early-evening pool parties, complete with live DJs, that are open to the public, too, on summer weekend. 27 Grand St., btwn 6th Ave. & Thompson St.